Spring has certainly sprung in the Bay Area, and our rose garden is in full bloom. 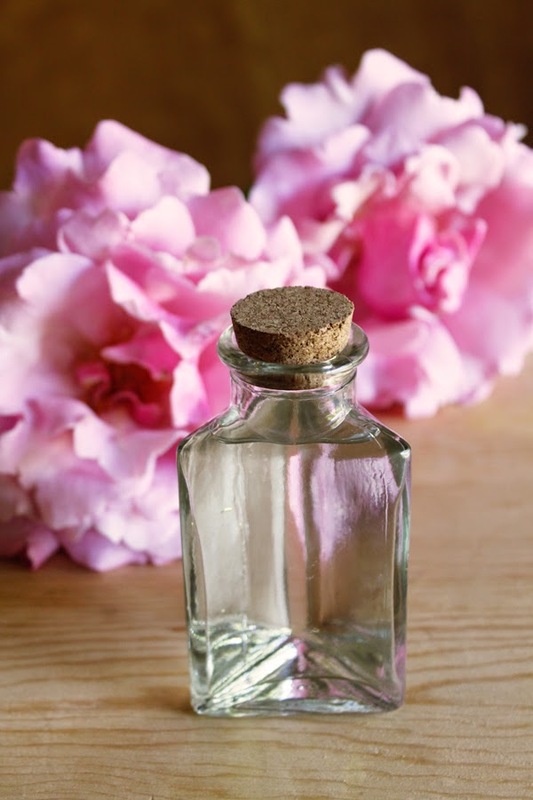 A friend had the brilliant idea that I should make rose water, which has long been used as a facial toner, among other things (more on that later). I once adored the now-discontinued rose-water toner made by Kiehl’s, so I loved the idea of creating my own floral face freshener. Plus, Refinery29 just called rose the “unofficial skin-care ingredient of spring 2014.” The flower has been praised for its anti-bacterial, anti-inflammatory, and anti-aging properties, not to mention its sweet scent. I consulted at least ten different sites for instructions, combining tips and tricks from all of them. 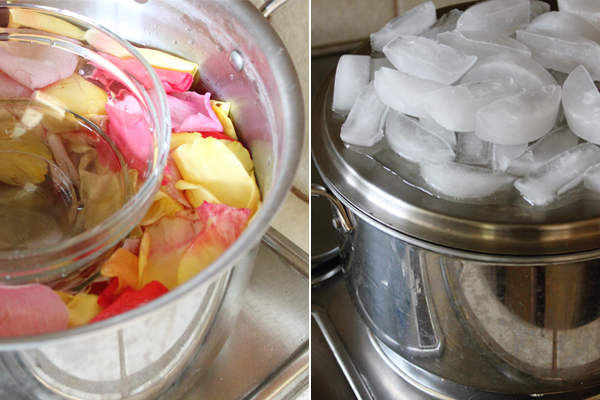 Here are the steps I took to make this multitasking water by distilling rose petals with steam. Don’t worry, it’s easier than it sounds. 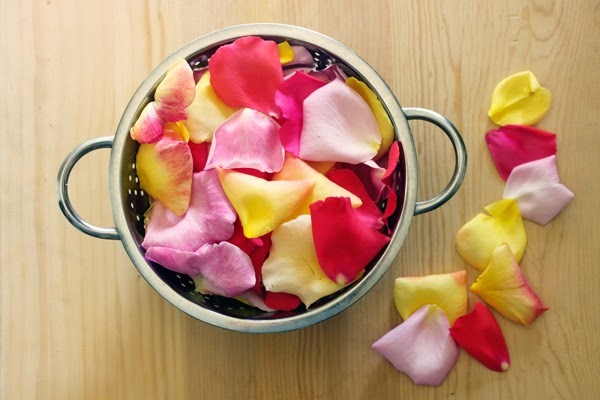 Gather enough roses to yield about ten cups of petals. Our roses are kind of colossal, so I only needed five. 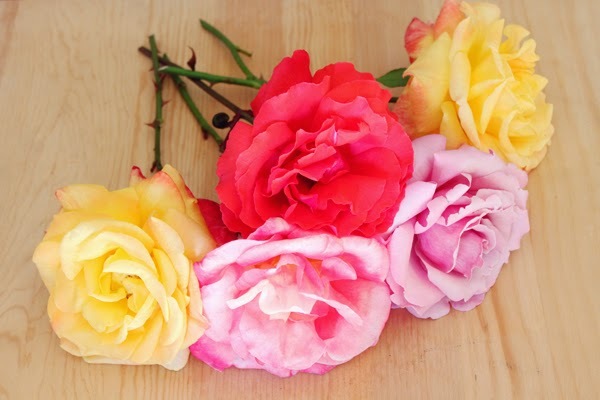 Tips: Be sure to use organically grown blooms to avoid pesticides, and choose the most fragrant of the bunch. The more fragrant your roses, the more fragrant your water will be. Pluck the petals and rinse with cool water. Next, you’ll set up your own still. You’ll need a large pot with a lid, a heat-safe bowl that fits inside the pot, and something to elevate the bowl. A few sites suggested using a brick to elevate the bowl. Since I don’t keep spare bricks around the house, I used two glass nesting bowls, placing the smaller nesting bowl in the center of the pot and the larger bowl on top, making sure that the top bowl still fits within the pot. 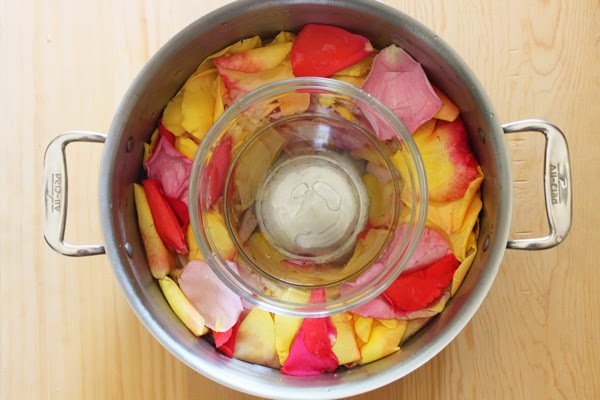 Place the petals in the pot around the elevated bowl setup and add just enough filtered water to cover the petals. The top of the elevated bowl should be at least a couple inches above the water-covered petals. Then create a little science experiment on your stove. Bring the water to a bowl, reduce it to a simmer, cover the pot with the lid upside-down, and place ice on top of the lid. When steam hits the cold, inverted lid, it condenses and drips into the elevated bowl, leaving you with pure rose water. Let the bowl collect this water for two hours. As the ice melts, carefully spoon away the ice water to be discarded (be sure not to spill any into the bowl or pot) and continue to add more ice. After two hours, remove the bowl with distilled rose water. I ended up with about one-and-a-half cups of delightfully fragrant water and poured it into a few bottles, including a spray bottle. After washing your face, apply with a cotton ball, or if you’re using a spray bottle, mist your face throughout the day. Another tip: Store in the fridge for freshness. 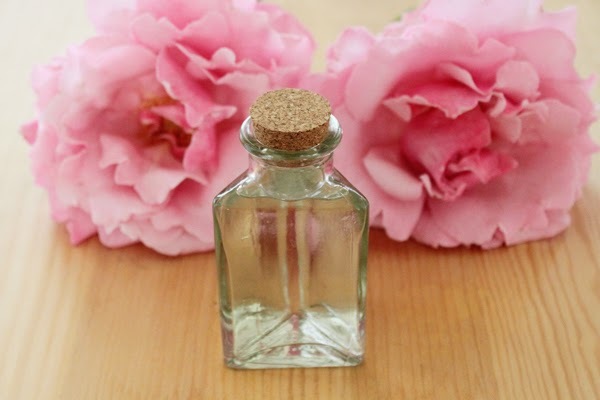 In addition to being an excellent facial toner, rose water can also be used to create some sweet things in the kitchen. It’s a common ingredient in many desserts (think baklava and Turkish Delight) and as I also learned, pairs extremely well with gin. That’s right—I’ve also been using my rose water to shake up some new cocktails, and this cardamon-rose concoction is amazing. For more edible ideas, the New York Times suggests putting a drop or two in a glass of lemonade or adding a splash to a bowl of freshly sliced fruit, and as soon as figs are in season, I plan to whip up this fresh fig and rose smoothie. A bottle of this water would also make a lovely gift (hello, Mother’s Day!). I think that’s more than enough reasons to stop and steam the roses—sorry, couldn’t resist. P.S. 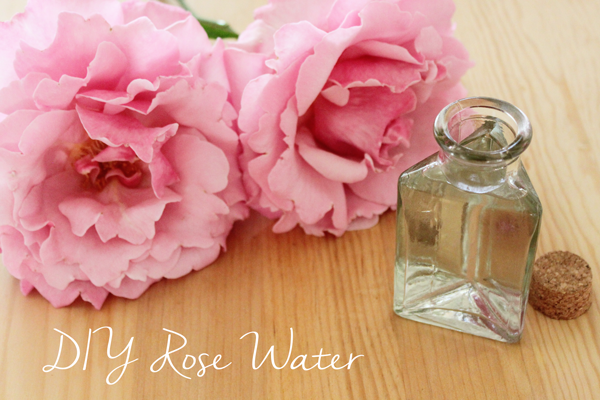 If you’d like more info on making your own rose water, here are the sites that I found most helpful: Care2, Organic Authority, and The Local Rose. First of all : I LOVE your pics! what a great DIY! will try it at home! Have you seen my latest blogpost ? I travelled to London for the RegentTweet blogger event . Read it on my blog!